To enable the Patent Application Alert Service to work in your browser, please make sure the following options are set. The main navigation bar has the following options. Home: Returns to the main site home page. Any system maintenace or other notices will be posted here. Contact: Opens up the contact / support form where you can enter comments or ask questions anout the service. FAQ: Frequently asked questions. Start here if you are having problems. Login: Access the alerts system. Register and Login here. Before you can access the Patent Application Alert Service you need to register and create a user account. 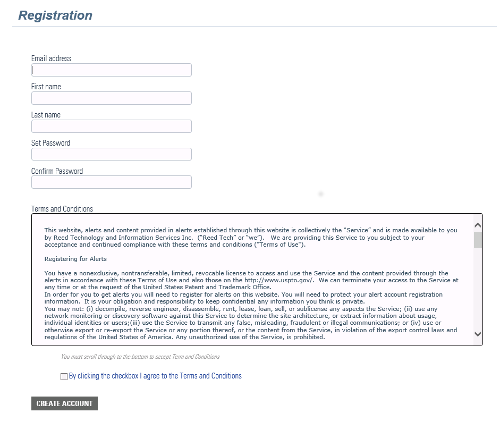 On the LOGIN page click the "register here" link and fill in all the required fields on the registration form. Follow the form's password requirements to create a secure password and read through the terms and conditions before checking the "I Accept" box. Press the "Create Account" button. Note that you must scroll to the bottom of the Terms and Conditions in order to check the "I Accept" box. After you click the "Create Account" button an authorization email will be sent to the email address you used to register. (If you do not receive the authorization email within a few minutes of signing up, please check your spam folder just in case the authorization email got delivered there instead of your inbox.) Click on the link in the email to complete the account setup. Now you can login using your email address and the password you entered. If you forget your password, it can be reset by clicking on the "Forgot Password" link. You will be asked to enter the email address you registered with. An email will be sent with instructions on resetting your password.